The International 2015 Los Angeles Auto Show opens to the public on Friday at the Los Angeles Convention Center – doors open at 11:00 AM. The Auto Show runs from Friday, November 20th through Sunday November 29th, including Thanksgiving Day, with extended hours on the weekends. Discount tickets are Available Now for select dates including Thanksgiving Day. Group ticket rates are available on purchases of 10 tickets or more. Tickets must be purchased in advance by contacting Julian Lile at julian@laautoshow.com or (310) 444-1850. This years 2015 LA Auto Show offers the Southern California auto enthusiast and their families an opportunity to be among the first people around the world to see some amazing new vehicles. Before opening day for the public on Friday, over 50 vehicles are expected to make either their world or North American debuts around the Los Angeles area. One of our favorites debuts of the show is a new SUV that runs on water (H2) – 2015 Hyundai Tucson Fuel Cell (FCEV). 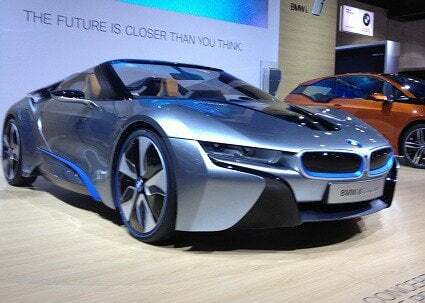 And, the Auto show includes a large selection of concept vehicles such as the hybrid BMW i8, along with the latest green innovations and customized vehicles from all the major auto makers. Stay tuned for more exciting news from the 2015 International Auto show. We are a groovy team of auto enthusiasts and over the next few days we will be sharing everything that we discover from the latest tech to all the new features and creature comforts! Are you promoting this event on FunGoDo.com – Jojo is on the Public Relations team for Toyota at the Auto Show in Phoenix. One of the first cars to run on water or Steam was the Rolls Royce. However, those early inventionsproved to be quite dangerous, blew up sometimes. My grandfather owned one and just loved it (Pat) He said the best car he ever owned.